For those of you who have been following the post about the World Vision controversy…finally…here is post 3 of 3. If you haven’t read posts 1 and 2, I would encourage you to do so first by clicking their links right here. I have been trying to figure out how to blog on this without it being an entire book. So…I spoke at a Church called “Just Church” in Surprise AZ recently. My message is my blog post 3 of 3. I wish the message was video, but it’s only audio. As you are listening…I have 3 “stations” on stage. Hot…Lukewarm…Cold. You’ll hear me go back and forth to each location as I walk us through what the Bible means when it says there are different kinds of sins. The Bible does NOT say that “no sin is greater than any other sin.” In fact…the Bible is clear…there are, for sure, 2 different levels of sin. My message spells this fact out. 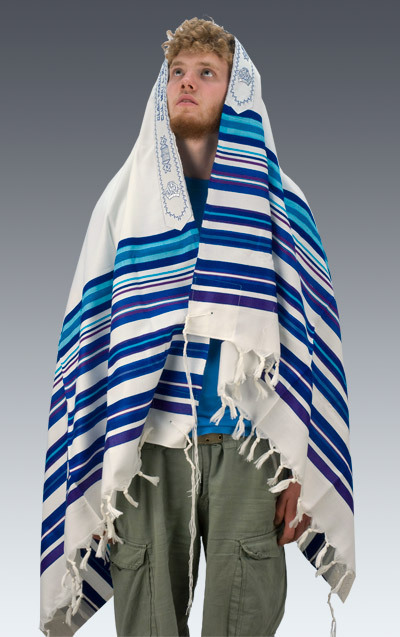 To help you envision what is happening on the stage…the only visual I had on stage was a Jewish Prayer Shawl called a Tallit. See Pic at right, so as you listen to the message you can imagine what it looks like when I am wearing the Tallit as I stand on the “Hot” station of the stage. If you have questions after listening to the message, please just ask. This message has a lot of controversy potential in it…but it was spoken in love…and it is Biblical Truth. Too many people are calling themselves Christian and at the same time are living in direct disobedience to how the Bible says they are to live. This kind of life is living Lukewarm. Please listen to the message for clarity on this. I love ya…and I’d do anything for you to help you follow Jesus more fervently.